Joan kept poetry notebook starting in 1932 when she was only 9 years old. Later, she kept a daily journal and a poetry/creative writing journal. Joan age 4 with her mother, Neva Wehlen. 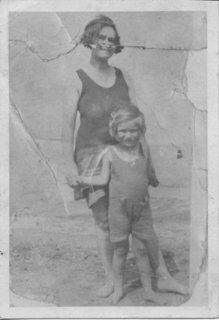 In honor of the centenary of the 2nd year of World War I–1915–I wanted to begin this year with a short story of Joan’s. One thing I learned from her WWII diaries was how potent the imagery of WWI was for her generation. She was born late in 1922 and grew up hearing about the “Great War” and seeing countless silent movies honoring that bloody conflagration. You can read more about such films here. Here is part 1 of 5 parts of her short story, “Greater Love Hath No Man,” written when she was 13 years old. I will be posting the subsequent parts of the story over the coming weeks. Early on a March morning, two boy babies were laid in cribs at St. Mary’s hospital in London. Being very newly born, there was no noticeable difference between the two and the red sun, peering through the window, thought they looked very much alike, the only difference being that one had grey eyes and the other blue. Otherwise they were both round and pink and very, very small. The babies looked at each other and gurgled as babies will and straightaway fell asleep. After a while the babies were taken to their respective homes by their respective parents and were duly admired, and christened by the same. 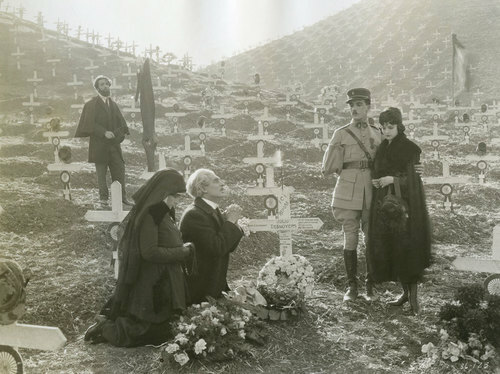 From the film The Four Horsemen of the Apocalypse (1921). Here is a famous movie from the silent era. Click here to see The Four Horsemen of the Apocalypse. Read other parts of this story as it continues….